Waggle receiving this award is a testament to its impact on student learning. 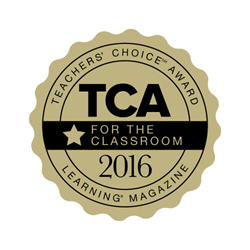 Waggle for English language arts from Triumph Learning, producer of critically acclaimed K-12 texts and interactive digital tools, earns the 2016 Teachers’ Choice Award in the classroom category. Presented by Learning Magazine since 1994, the prestigious awards selected 30 winners based on scores from the evaluations done by a panel of teachers across the country. Waggle is a personalized, online learning program focused on practice that is designed to help students conquer skills and achieve success beyond the test. Using true personalization, Waggle meets students where they are along the learning path in English language arts or math and promotes productive struggle. When Waggle facilitates productive struggle, students become more self-directed and empowered to take ownership over their own learning. A team of teachers evaluated Waggle on quality, instructional value, ease of use and innovation. Only products that meet the educators’ stringent standards are chosen to receive a Teachers’ Choice Award. Triumph Learning, LLC, is a leading educational content company and publisher of print and digital K-12 resources, standards-aligned instructional materials and effective literacy programs. Its state-customized products increased student achievement and raise scores on high-stakes exams for more than 6 million students in 36,000 schools in 2013 and 2014. Triumph Learning offers unique student solutions, robust teacher support, and professional development opportunities. Triumph Learning is committed to serving all students with a mix of interactive digital tools and innovative student texts with products such as Coach and Waggle. For more information, visithttp://www.triumphlearning.com/waggle. (SAN JOSE, CALIF.) September 29, 2015- Two of the biggest issues facing higher education institutions are the 48% dropout rate within the first two years of college and the increasing cost and difficulty of recruiting students. A majority of high school students enter college undecided about their majors. Experts believe this indecision is a leading cause of dropouts within their first two years, costing $4.5 billion a year in lost income and federal and state taxes. Also, recruiting and retaining students to traditional higher ed programs is becoming harder due to online degrees, reduced recruiting budgets, and teens rethinking higher ed because of high costs and uncertain job prospects. Myverse is a guiding light for college admissions staff and recruiters looking to help students start college on the right foot and prevent dropouts and major changes. It also serves as a recruiting tool, potentially saving higher ed institutions hundreds of thousands of dollars in recruiting cost by matching students to colleges shown to fit their interests and career path. The web-based platform provides students with videos highlighting each career path and recommends colleges, allowing the student to learn more about their individual results. “Myverse provides a fun, yet reliable, color quiz that speaks the language of today’s 21st century, tech-savvy students. Free for students of any age to use, we have set out to revolutionize the way students and educators look at education,” said Wayne Sharp, Myverse’s founder. Currently, 50-70% of college students change their major at least once, some changing at least three times before graduation to match current job trends. Myverse helps students make informed academic decisions by pinpointing what they’re naturally good at, informing them of what jobs they are suited to, and guiding them into a college and major they will enjoy — leading to a career they not only like, but also excel in. “Secondary education shouldn’t be about getting through the next paper or the next final exam. It’s bigger than that. It’s about finding a career that best suits each individual, leading to overall success for a lifetime. Myverse provides the starting point in this quest for students and those helping them along the way,” said Sharp. MyVerse is an online and mobile resource for middle school and high school students, focused on psychometrically matching teens, in less than one minute, to 1-5 careers. The site provides matched career videos, relevant majors and courses, and finally, matching to colleges. (CHICAGO, IL) September 29, 2015- TeacherMatch® is pleased to announce strategic research partnerships with Peter Goff, PhD; Ron Ferguson, PhD; and Tripod Education Partners, Inc. TeacherMatch’s software portfolio, which includes the revolutionary, predictive analytics platform, the Educators Professional Inventory (EPI®), was developed in collaboration with a research consortium of universities, education nonprofits, and experts in predictive analytics and psychometrics. Through their ongoing, collaborative partnership with Dr. Goff, Dr. Ferguson, and Tripod, TeacherMatch is able to build on its research-based offerings that provide district partners with insights that better inform their hiring practices. Peter Goff, PhD, is an assistant professor in the school of education at the University of Wisconsin at Madison. His research and areas of expertise span the teacher hiring process, with special areas of focus including the timing of applicant hiring, the implications of the hiring window, and how that impacts the quality and quantity of applicants as well as the variety of questions asked in the hiring process. Ron Ferguson, PhD, is the Faculty Co-Chair and Director of the Achievement Gap Initiative at Harvard University, where he has taught since 1983. Dr. Ferguson is an expert in understanding teaching practices that improve a range of outcomes including student engagement, executive function skills, and achievement. Through his extensive research he has developed the Tripod framework and survey assessments, which include the Tripod 7Cs measures of effective teaching. Numerous independent research studies have found the 7Cs measures to be predictive of achievement gains and among the most reliable of measures commonly available. Dr. Ferguson brings a unique perspective to the research consortium at TeacherMatch. His findings and insights will be incorporated into TeacherMatch’s dynamic EPI, a platform that predicts the impact teacher candidates will have on student achievement. Additionally, Dr. Ferguson will provide guidance on improving assessments and items within the platform. Tripod is the nation’s leading provider of classroom-level student survey assessments for K-12 education. Through this partnership, TeacherMatch looks to leverage Tripod’s analytic framework and survey results to support school improvement and professional learning for teachers. With the incorporation of new data from Tripod survey assessments, TeacherMatch will continue to build out their solution to ensure that each classroom has a highly effective teacher positively impacting student achievement. TeacherMatch®, created for educators by educators, is committed to Advanced Education Talent Management™. Its proprietary TeacherMatch 360™ system facilitates all stages of the teacher hiring process, from recruitment and interviewing through onboarding and professional development. This all-in-one portfolio helps schools identify, hire, and develop more effective teachers in an effort to give students the best opportunity to succeed. For more information, please visit teachermatch.org. (ENCINO, CA) September 29, 2015 – To meet growing demand for its consulting and edtech services, Insight Education Group has appointed Jason Culbertson as a partner and Angela Ritchie as a managing director. Charged with overseeing all aspects of Insight’s work with states, districts, and schools across the country, Culbertson and Ritchie bring extensive backgrounds in K-12 and higher education to their positions and share in Insight’s vision of a great teacher in every classroom. As a recognized leader in standards-based instruction and educator effectiveness, Insight supports the implementation of large-scale initiatives through innovative approaches to school and district improvement, strategic planning, professional growth, and edtech. The addition of Culbertson and Ritchie comes in response to Insight’s growing influence in the field and an increased need for strategic support by education leaders to impact student achievement. In his 15 years of experience in school, district and state leadership roles, Culbertson served as a teacher and administrator prior to joining the South Carolina Department of Education as the Executive Director of the Teacher Advancement Program (TAP). Working specifically with underperforming schools across the state, he provided on-site training, thought-partnership, and innovative solutions to meet schools’ needs. Most recently, Culbertson served as Executive Vice President at the National Institute for Excellence in Teaching. A prolific author and speaker, Ritchie comes to Insight from Catapult Learning (formerly Edison Learning), where she served as Vice President of Educational Services and Comprehensive Needs Assessment Lead. While there, she partnered with the Hawaii Department of Education to build educators’ capacity to increase student achievement through the effective implementation of the Common Core, formative instruction and data teams, comprehensive student support systems, educator effectiveness models, induction and mentoring programs, and academic review teams. She has a proven track record of turning around persistently low-achieving schools. Prior to her work as an external educational services provider, Ritchie served as a school and district level administrator in traditional public, charter public, virtual, and private schools in a variety of preK-12 constructs. She has also served a teacher, graduation coach and as an adjunct professor in both public and private universities. Insight Education Group is a national educational consulting and edtech company that supports the growth of teachers and school leaders. Since 2000, we have specialized in developing deep partnerships with school leaders to understand their unique challenges and work together to design and implement large-scale educator effectiveness solutions that drive lasting change. For more information, visit http://www.insighteducationgroup.com. Cincinnati, OH (September 29, 2015) –Several consecutive years of making budget cuts combined with a recent state budget appropriation resulted in staff reductions and left Wayzata Public Schools evaluating whether to continue with its plan to implement new programming to strengthen their safety and regulatory compliance processes or to scale back expenditures. To decide if the programming was worth the expense, Wayzata Public Schools piloted PublicSchoolWORKS’ Student Accident Management System with district nurses and the Online Staff Training System with the administrative team this past school year with extremely positive feedback. As a result, Wayzata Public Schools will begin a full implementation of the Student Accident Management System and the EmployeeSafe Suite this year. Prior to the pilot, Wayzata Public Schools’ student accident reporting process relied on the manual completion of a student incident form, which was photocopied and then distributed to various parties. After distribution, it was difficult to review trends and take preventative actions to reduce the district’s risk as there was not one single repository to keep injury records. To stay on top of filed reports and track their completion, district staff often had to come into the office on weekends. The process created unnecessary risk and a substantial amount of manual effort trying to keep track of reports. For example, if a student was hurt and the principal did not immediately see the paper form, parents may not have been contacted immediately. This, along with not having a central location for all related records, left the health and safety coordinator unable to create a prevention plan because similar incidents may have gone unnoticed. The Student Accident Management System streamlines the reporting and investigating of student accidents, along with the resolution of the associated hazards. As soon as an accident occurs, a staff member submits an online accident report. The system then automatically alerts the principal and other necessary staff via email to take action, thus making the principal aware so that appropriate communication with parents can be accomplished quickly. A central online incident library maintains the records so the health and safety coordinator can see if a similar accident has previously occurred, which can shed light on potential prevention tactics. The Student Accident Management System and EmployeeSafe helped accomplish three district goals. First, students are safer because incidents are reported quickly and the district uses the accident data to create prevention initiatives. Secondly, the improved reporting and automation speaks to the district’s goal of “operational excellence” – an initiative that was created to build and maintain the surrounding community’s confidence and trust in the district’s processes. Lastly, it is helping the district avoid unnecessary risk and associated expenditures. The local school board and community place a high value on prudent financial practices, which has allowed the district to receive and maintain a “AAA” bond rating since 2008. The AAA bond rating has been awarded to the district by Moody’s Investors Service due to “evidence of the district’s strong financial health.” While the distinction has advantages such as access to lower interest rates and borrowing costs, equally important is the message it sends that the district is committed to operational excellence in all of its matters. Since 2000, PublicSchoolWORKS safety and regulatory compliance management solutions have helped schools easily meet ever-changing compliance requirements, improve staff and student safety, cut costs associated with risk, and reduce administrator and staff time and effort. PublicSchoolWORKS is the only, complete safety compliance management program built for K-12 schools, and is proud to provide districts with award-winning technology and support recognized by North American educators. For more information on how PublicSchoolWORKS can improve district safety programs, contact 1-877-779-6757 or sales@publicschoolworks.com. Research suggests that math mastery is an acquired skill refined through consistent practice, and that making math practice student-centered is the real need of the day. Splash Math’s freemium application helps all students by prescribing an individual learning path, then adapting their practice plan based on feedback and progress. “We believe Splash Math can be the standard in K-5,” says Deep Nath. Sunburst and Splash Math will partner on the release of Splash Math Premium for School later this fall. The Premium program features new curriculum alignments, teacher administrative controls and the real time ability to ensure all students are working on Common Core State Standards and state standards-based practice routines that are fully aligned to all high stakes assessments. Splash Math is accessible from iPads, iPhones, Chromebooks or desktop computers. Teachers can pinpoint problem areas through real time progress dashboards, weekly email reports and individualized assessments. Once a student login is created, the program can be used on multiple devices with the same login and the progress of each student is analyzed in real time. About Sunburst: Sunburst has connected educators with instructional technology and digital content solutions for three decades. We sell, support and provide curriculum services directly to schools. Our solutions are found in more than 95% of US school districts. We selectively work with educational development companies launching products by helping schools and partners take risk out of innovation. We believe implementing instructionally sound digital content solutions enhances teaching and raises outcomes. About StudyPad Inc: StudyPad, through its award winning solution Splash Math, translates difficult math concepts through game based practice modules to make learning more fun and effective for all students. Splash Math lessons address rigorous math requirements for all CCSS standards through interactive gaming designed by educational experts. Splash Math’s solution is built native to popular mobile technologies, producing an experience with a higher level of engagement than any other Math practice App. More than 12 million students use Splash Math worldwide. Over the past few years, TeacherLists has helped our students get off to the right start when they begin. TeacherLists, the smarter way to manage, share and find school supply lists, announces St. John Brebeuf School in Niles, Ill. as the winner of the 2015 ‘Schools Work Smarter’ sweepstakes. St. John Brebeuf School was selected out of 500 schools to receive a $5,000 prize to help fund a 1:1 technology initiative in the 2015-2016 school year. St. John Brebeuf School piloted a 1:1 Chromebook initiative last year that provided 60 tablets and 60 Chromebook laptops for students to use for lessons and educational games. The goal of the three-year program is to familiarize students with technology and the positive role it can have in their learning. For more information about TeacherLists, visit http://www.teacherlists.com. TeacherLists is the smarter way to manage, find and share school supply lists for teachers and parents, free-of-charge. After uploading a school supply list once, educators can easily update and link the list to a school or personal website. TeacherLists provides parents the freedom of accessing and finding the most updated school supply list, twenty four-seven. For more information about TeacherLists, visithttp://www.teacherlists.com. Chicago, IL – September 28, 2015 – In order for coding and computer programming instruction to have a positive impact on early learning classrooms, the teaching methodology needs to embrace important social, emotional, and motor-sensory best practices set by NAEYC (National Association for the Education of Young Children). Sunburst and Wonder Workshop have partnered to release three solutions for K-12:Wonder Pilot, Wonder Class 24, and Wonder Class 30. The Wonder Pilot program provides K-5 classrooms with (3) sets of “Dash & Dot” robots, the software apps and a Wonder Teacher Kit, including the curriculum and necessary accessories suitable for small group instruction. Wonder Workshop recommends a ratio of one robot set for every three pupils. “Our business is dedicated to serving two important constituents: schools and innovation-based partners. Our work with Wonder Workshop is exciting as it addresses what we know K-12 needs – practical tools to better cultivate 21st century skills in young learners,” says Holly DeLeon, VP of Curriculum Integration at Sunburst. Wonder Workshop began with a successful Kickstarter campaign in October 2013 to help teach elementary school kids to code through their smart, innovative robots. The company then launched Dash & Dot in November 2014, and within its first month, delivered more than $3.5M in robots to 37 countries including the U.S, Canada, European Countries, Asia and Australia. Wonder Workshop is a STEM-based interactive learning experience that introduces coding in ways suitable for K-5 learners. “Our integrated hardware, software and curriculum solution is designed to introduce 21st century skills to young students by using an instructionally sound approach where hands-on, sensory play combines with the right mix of fun and guided learning for both students and teachers,” says Raghu Sethuraman, COO of Wonder Workshop, Inc. Teacher feedback indicates a bundled solution is less abstract for young learners to grasp, while older students are better able to digest software-only-based coding programs. The curriculum package includes 30 standards-based lessons for each of the partnered solutions which highlight correlated Math, Science and specific ELA skills within the instruction. About Sunburst:Sunburst has connected educators with instructional technology and digital content solutions for three decades. We sell, support, and provide curriculum services directly to schools. Our solutions are found in more than 95% of US school districts. We selectively work with educational development companies launching products by helping schools and partners take risk out of innovation. We believe implementing instructionally sound digital content solutions enhances teaching and raises outcomes. About Wonder Workshop: Wonder Workshop is focused on bringing learning and laughter to children everywhere in the world. The company’s team of specialists in technology and education believe every child should be empowered to question, think, and create. Coding enables creativity and by learning to code children shape their own future. Wonder Class solutions offer elementary classroom teachers bundled award winning robots, and the software-based curriculum programs designed to effectively introduce programming and coding skills to young learners. The company has currently raised $15.9 million in funding from Madrona Venture Group, CRV, WI Harper, Google Ventures, Bright Success Capital, Maven Ventures, Vikas Gupta, Reza Hussein and Jeff Schox. For more information, visitwww.makewonder.com.